The reason that makes Android the most widely used and top mobile phone operating system is its open nature. Android allows its users to customize the OS in countless ways. You can modify an Android device the way you want, port features from one device to another, change the cosmetics of your device, introduce new features and a lot more. The customizations in Android can be made by using different applications, by editing the system itself or by flashing custom ROMs. Flashing custom ROMs changes the whole system, so if you only want to make a few changes in your stock firmware, you have to tweak the system of your phone. Here on our site, we’ve posted tons of custom ROMs, tweaks, root applications, Mods etc, but one thing that we haven’t discussed so far is the build.prop file. Basically, the customization within the Android system begins from the build.prop files. This file contains the build settings and properties. Build.prop file contains some settings and properties inserted by device manufacturers. Some of these settings and properties are inserted by Google in Android. A number of build.prop properties are same for most of the Android smartphones. These properties include the model number of the device, manufacturer name, device ID and all such information. By making changes to the build.prop file, you can activate a handful of features that are apparently locked by device manufacturers. You can activate the hidden features as well which are meant to be in experimental stages just like the newly introduced multi-window feature in Android 6.0 Marshmallow. One of the most common uses of editing build.prop files are to enable WiFi tethering on some phones which are apparently locked by different carriers. Common uses of editing build.prop file includes improving phone ring capability, unlocking WiFi tethering, changing DPI of the screen, enabling lock screen and home screen rotation etc. You can enhance the scrolling speed, boot up speed as well by editing the build.prop file. To be able to make changes to the build.prop file, your Android device must be rooted. There’s a lot more you can do, for now, we are here to give you a basic idea of build.prop file only. 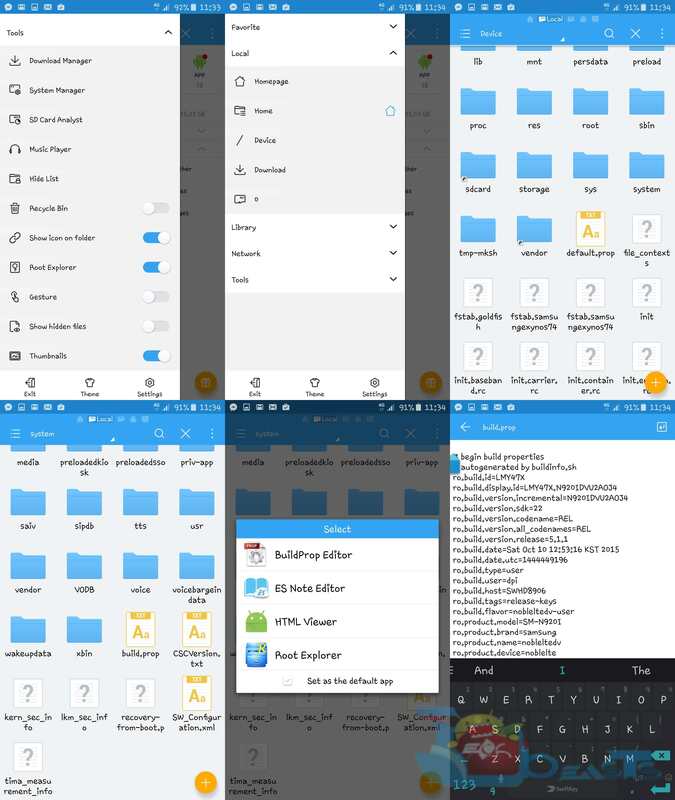 Now that you know what is build.prop and why you may need to edit it, we will go through a few steps that will help you to reach out this file in your Android system and make changes to it. We will discuss two different methods. Let’s have a look now. Make sure that your Android phone is rooted. Download and install Build.prop Editor on your phone. Open BuildProp Editor from the app drawer. Give it the root permission. Now you will have the list of all Build Properties on screen. You can make changes to this properties from this menu directly, but probably you will also need to add new properties so have a look at next step. Tap the small “Pen” icon at the bottom. It is the third last icon at the bottom. You will have all build properties opened in a text editor. Now you can add a new property, remove a property or make changes to an existing property. Once you’re done making changes, tap the save icon at the top. You will have the changes implemented on your device now. That’s all. Now under “Local” tap “/ Device”. This will open the root of the device. Now you can make changes in the build.prop file. That’s all. Got any queries? Feel free to reach us out through the comment box below.